Initially, I thought I’d like to keep my POTS line around, just in case the quality was poor, or there were problems. To hook VoIP into your home phone system, you’ll need an ATA, or a PC running PBX software like Asterisk with an FXS-capable card. I opted for an ATA, as these are usually mass produced and self contained. This would get me something affordable, and easily replaceable. I originally ordered a Linksys PAP2-NA from eBay. In hindsight, it would have been better to avoid this step. A lot of the ATAs listed on eBay that are listed as UNLOCKED, are in fact, LOCKED. That means they’ve been provisioned to only work with one provider, usually Vonage. I’m sure there are work-arounds, but you might as well buy a real unlocked ATA at retail and save yourself the hassle. 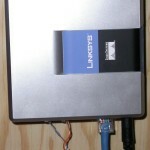 Reviews for both the Linksys PAP2T-NA and the Linksys SPA2102 were both favourable. There is some confusion as to whether the PAP2T-NA can handle 2x g729 calls at once. There is no confusion regarding the SPA2102, so I opted for that device. The SPA2102 also includes routing capabilities, but they are not great. You can set the device to be just an ATA, and not an ATA+router. Newegg‘s price is okay, and so is Amazon‘s. Another option worth considering if you are a hacker, or open source aficionado would be the fully open IP0X, which “runs Asterisk and uClinux on a powerful embedded Blackfin processor”. I’ll probably look into it when time/budget allows. You need to create an account with voip.ms. Go to their website, and follow the directions/form. You will need to order a DID (incoming phone number), and associate it to your account (or put a Port request in if you are switching you phone number over right away). There are various parameters that you can configure on the DID, depending on your preferences. I set the routing via SIP to my main account, and my point of presence to Toronto. The other settings are optional (like fail-over, caller id, etc). From there, if you want two outgoing lines (no charge! ), you can create a sub account. This will let you have two outgoing calls from your house at once, taking full advantage of the two phone ports on the SPA2102. They can have the same number show up on Caller ID, so people you call won’t know that you are calling from the second line. Some basic changes were required to be made to the default configuration of the SPA2102. Since it is a router, it is running a DHCP server on the LAN port by default. You may want to connect your PC directly to this LAN port when doing your initial config. I’ve noticed the stock firmware has been really old on any units I’ve purchased. I’d advise downloading, and installing the latest firmware for the SPA2102 before you get too far. You may need a Microsoft windows machine to use their firmware update utility. I used my Windows 2000 VM. I haven’t tried it under wine. You will probably set a static IP on the WAN side to a real LAN address on your LAN, and also the default gateway to the correct default gateway. Once you saved these changes, you should be able to plug the ATA into your LAN via the Internet port on the back of the ATA. Use your browser to reconnect to the new static IP you’ve assigned to the WAN. You will want to enable QoS on your router, if it supports it. The configurations are different for each one, but in principle, you want the traffic to and from the ATA to have the highest priority. You’ll probably also want to forward UDP ports 5060, and 5061 to the ATA. At this point, the ATA should be registered with voip.ms, and you can plug a phone into the back of the ATA, and dial out from either line. As I mentioned, I wanted to keep my POTS line around to test to ensure the VoIP was satisfactory. I called TekSavvy, and had them enable call forwarding (can take some days). I ordered a temporary DID from voip.ms. Once everything was ready, I dialed *72 and then my new DID, on my POTS-connected phone, and hung up. I called my home number, and sure enough, the phone attached to the ATA rang. I have DSL on my POTS line as well. 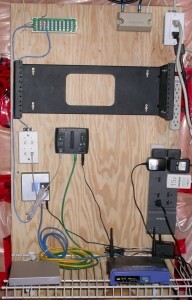 Fortunately, I switched to a much simplified wiring setup when I prepped my line for DSL. 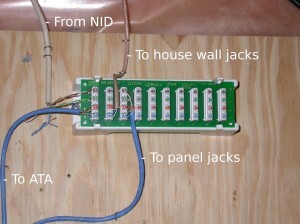 It was simply a matter of disconnecting my POTS splitter from my home line, and also disconnecting the second line (orange pair) from outside. I whipped up a cable to go from the two phone jacks on the ATA to the first and second line in my house, and punched it in. I was now using VoIP for all incoming and outgoing calls. One thing to note that is probably important, at this point there was no 911 availability on my home phone, since it was all VoIP and I was playing some games with Caller ID + call forwarding to make it look like I was calling from my POTS line. After a few months, I was satisfied that the VoIP was more than sufficient to replace my home phone. I decided to take the plunge. It was now much more important that my Internet didn’t go down; that would also affect phone service too. I didn’t want any confusion to happen with Bell because I’m using TekSavvy for home phone + Internet, and there is such a potential for problems (i.e. Bell’s problems), so I decided to order a second dry-loop DSL. I switched my main Internet over to the dry-loop, and then put a Porting request in to voip.ms for my home phone number. After the port was complete (7 days), I called TekSavvy to ensure that my home phone, and old DSL account was cancelled. I switched my VoIP account so that my POTS DID was pointed to my main account, and deleted my temporary DID. From there, I was able to activate 911 service. You will need to enable these features on each of the two lines on the ATA separately. To dial the codes, simply pick up, dial, and wait for a second dial tone. Hang up when you hear it. Caller ID Activate will tell the ATA to do Caller ID lookups. Doing the Call Waiting codes will give you visual call waiting. I’m now running on pure VoIP for several months, and I’m very pleased with the service. We had some routing issues calling a Rogers home phone, but I put in a ticket, and things seem to have been resolved. My dry-loop DSL is more expensive than just DSL, but with my average monthly phone bill at $8, I still save around $23 per month. I’d recommend going to VoIP to anyone, especially if you already have a cell phone. Home phone quickly becomes less important then. 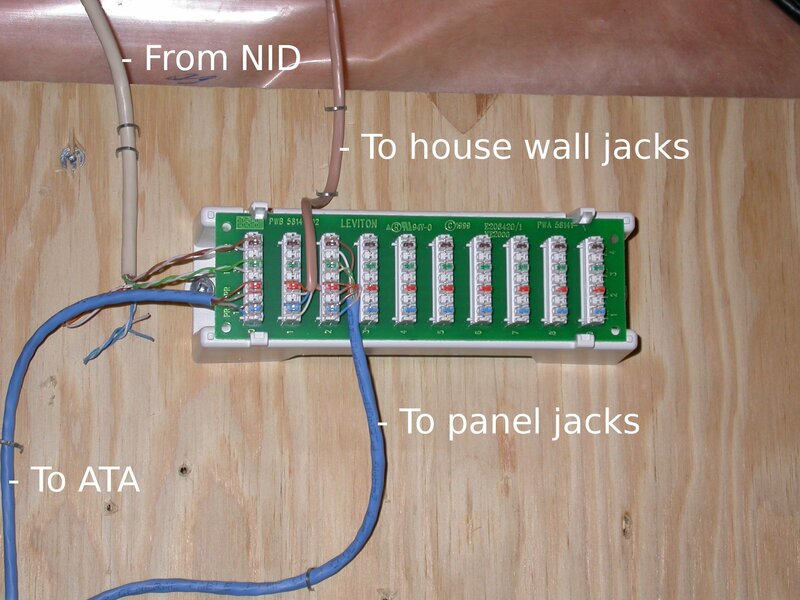 Great wiring articles. I’m planning something similar and your accounts have been quite useful. I’m curious though, where did you get the rack mount in the picture above and did you remove your DSL filter as it appears to be missing. Keep up the good work. Thanks – glad you’re finding them useful! I got the black rack at Nedco in Whitby, but they charge way too much. I’d go to monoprice.com, they’ve got a good selection of racks for cheap. I removed the POTS splitter that I used in the Belle Your Phone article, as I’m on a dry-loop now. No filter required, as there is no phone equipment attached to the line now. I went for cable internet because it’s supposed to be better for voip. I got 3web until i moved to a condo where they had a private internet carrier (still through cable). i convinced my dad to give voip a try and we moved the phone number from bell to 3web. In my condo I found out of freephoneline.ca where you don’t pay for a phone at all, except long distance. I also setup my parents with freephoneline.ca on the spa2102 so they got 2 phone lines active. with 3web you get 10MB down and 500kbps up (slightly better than rogers) for 40$ including voip. of course, you have to set it up manually with linksys linux (canada computers) router, else the spa2102 will cap your speed at around 7MB (looks like this is hardware limitation, nothing you can do unless you bridge it) For linksys router, i have tomato firmware. search the posts for the proper qOs settings to give your spa2102 the highest priority. I watch netflix, download torrents and still make a phone call with no issues or even a glitch of interruptions. If you don’t want to bother with all that, then just follow the instructions from this article and should be just fine. Just wondering if you can provide more information about why cable internet is supposed to be better for voip. That doesn’t make sense to me. Things like latency and jitter affect your quality – I’m not sure how cable would have an advantage on these variables over DSL. I see the post is old, and you’ve probably tested this too, but just in case: I use freephoneline.ca for home phone. You get a real phone number and they only charge a one time fee of 50$ for the ATA “configuration file”. The software version is free and forwards the voice messages to an email account, in case you need another number for spammers :). Canada calling is free if you don’t need to call some obscure village up north, US is 0.02. I found it to have the same quality/drawbacks as any other VoIP provider (I’ve had Acanac and Teksavy in the past). Thanks for providing your approach and experiences. I did exactly the same thing. I use Rogers cable. It took less than 30 minutes to configure. Voip.ms service is wonderful. I am now porting my home number. Let me add my 2 cents of encouragement. We live in downtown Toronto, and decided to drop Bell. We converted from DSL to Teksavvy cable (no dry loop costs), signed up with voip.ms, bought a PAP2-NA on eBay (zero problems), and ported our old home phone number over to voip.ms. We have a multi-unit cordless phone system, I just plugged the base station into the PAP2. Our old cost: $50 or so a month for POTS phone, plus $5-10/month for discounted LD via Yak. Now: $1 fixed cost and under $5/month for usage. Call quality has been very good. Service has been very reliable. voip.ms has been a pleasure to deal with. voip.ms offers rock-bottom pricing and everything is a-la-carte. We opted not to pay for 911 service, since we generally use our cell phones for local outgoing calls — we wanted to retain a “household” number at minimum cost. If you are paying $40-50 for a home phone, I suggest you seriously think about the voip alternative. If you are at least a LITTLE tech-savvy, I suggest you look at voip.ms or one of their competitors, rather than a company that bundles hardware and service and charges $10-20/month. It will require a little effort to set it up, but then you save real cash every month. Derek, I was very encouraged by this article on ditching Bell. I am with Rogers cable in Ottawa and have just signed up with voip.ms and Im trying to run FreePBX. However I’m having a hell of a time getting it to work. I can receive incoming calls but outgoing calls fail. If I send you my SIP trunk config for voip.ms would you please take a look at it? 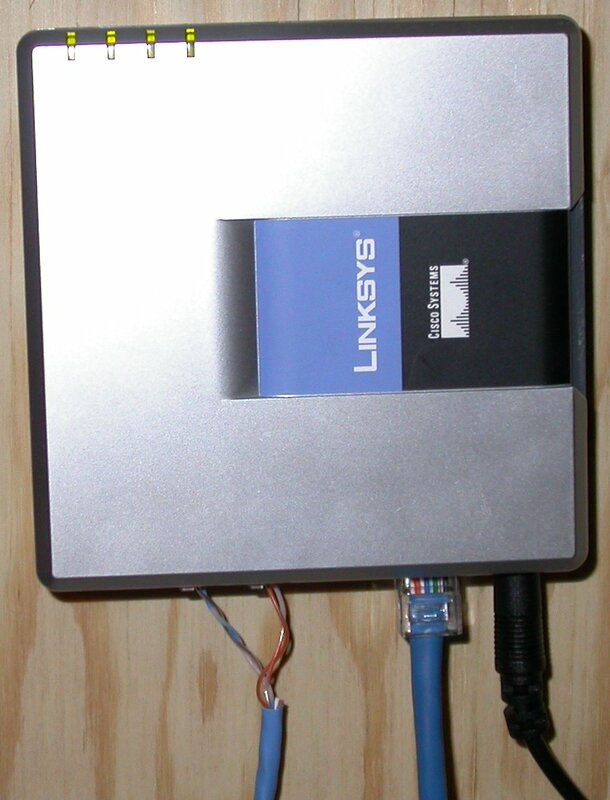 I also would like some pointers on configuring my router, which is a Linksys E1200. Maybe that’s the problem. — Regards, Mark. I haven’t touched Asterisk or FreePBX, however, voip.ms had this to say about it. Try comparing your config to their reference. My config for the SPA2102 was based on their reference, and the various support tickets over time. I would try to set up IAX as the transport, as I understand it, there’s less to go wrong with the NAT – but you’ll have to do the research.